Is Lacto-Fermented Homemade Ketchup Worth the Trouble? Most store-bought ketchup has high fructose corn syrup, so I've always bought organic ketchup since my “food conversion”. Recently I wanted to give homemade ketchup a try, and it turned out to be a very simple process. First I’ll tell you how I did it, and then I’ll share my conclusions and let you know if I’ll do it again. Mix well with a hand blender. That’s it. Make sure it’s in a glass bowl and leave at room temperature for two days. I then transferred it into our old ketchup bottle in the fridge (using a baby spoon) to more easily get it by the kids. (The rest I put into a quart-sized wide-mouth mason jar to store out of the way in the back of the fridge.) If you think it tastes significantly different from what your family is used to, then start with mixing half of the “regular” ketchup with half of the homemade ketchup. I thought it tasted pretty good! The cost is the same or very close in comparison. Yes, this homemade ketchup is lacto-fermented, but we just don’t use that much ketchup to make this the best way to attempt getting more lacto-fermented foods into the kids. I’m glad I tried it, but I just don’t see making homemade ketchup as “worth it” – I’d love to hear your thoughts on this, though. What do you think? I’m super lazy 😉 I just use pre-made ketchup (organic, with no HFCS) and use the NT recipe, including the fish sauce (so yes, I do keep some around – but it takes a loooong time for us to use it as we 2 adults don’t eat much ketchup). I like the taste of it better than plain ketchup, but I really don’t make it often (because we eat so little of it). Just throwing this out there for anyone who might be interested. 🙂 Thanks for a great post, as always, Kelly! I use Bionaturae Tomato Paste in glass jars. I leave out the fish sauce and it turns out great! love it with fresh garlic too. I’m told that organic brands of products are supposed to be in non-BPA cans; you may want to check with the company you are using. 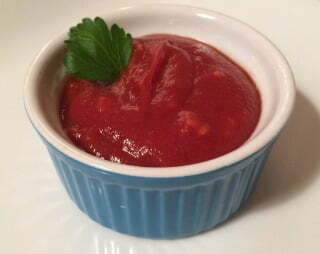 I have an easy homemade ketchup recipe I use, but I haven’t tried lactofermented. I barely tolerate yogurt, and some sourdough. ha ha, Misti Schroeter. I think we have a mutual acquaintance! couldn’t you use anchovies in place of fish sauce? They’re not fishy tasting but are nutrient dense. They add the saltiness that I think ketchup needs. The problem I have with homemade is that it doesn’t last as long in the fridge. I’ve been buying organic. We rarely use ketchup these days, except for the occasional hot dogs. So now I’m wondering…. why DOESN’T organic ketchup go bad in the fridge? Hmmmmm. What are they putting in it? I think I’ll try your recipe Kelly, just to see what the kids think. And for paste, I’ve been buying BioNature. Cindy, I always use anchovies. Two filets per quart. I just found instructions on how to make tomato paste and I am still wondering why I have been buying it all this time. Par boil the 5 pounds of tomatoes so the skin will come off then strain though a wire mesh to remove the seeds. Spread the pulp onto a cookie sheet ( I am thinking more than one.) and put in the oven at 350 to roast and dry out. Just so you know many of the BPA free plastics use a different compound called BPS (can’t remember what it stands for) since BPA was thing to study BPS has not yet been studied. Bottom line is: plastic is plastic. There are tons of chemical compounds that may leech into what they are holding and be harmful. We just don’t know yet. Might as well avoid it altogether. Plus plastic cannot be recycled. Just down cycled. So if you can avoid the use of plastics then it is better for everyone. This recipe can be multiplied by increasing all ingredients proportionately. Process tomatoes and bell peppers in a food mill, processor, or blender until well pulped. Transfer to a pot and bring to a boil. Boil for 2-3 minutes. Place mixture in a piece of tulle, and using a strainer, suspend it over a bowl. Leave to drain for 12 hours in the refrigerator to remove all excess liquid. Transfer mixture to a glass or ceramic baking dish and stir in salt. Allow to come to room temperature then dry in a lukewarm oven (200-210°F or 95-100°C) for 15 to 20 minutes. Spoon into sterilized glass jars, taking care to avoid creating air pockets, and top with 1/4 inch of extra virgin olive oil (enough to cover completely). Store in the refrigerator until ready to use. Eden Foods’ products are processed without BPA. The owner of the company choose the more expensive canning process that his “grandmother would have used”, because he was repulsed by the dangers of BPA. Eden Foods tomato products are packaged in amber glass bottles. Again, this is the conscientious, though more expensive, canning process, that Eden Foods chose for health and safety concerns (the same ones many savvy consumers have regarding BPA. I am one of them, and first read this information on the Environmental Working Group (EWG) website. I do not work for Eden Foods, and am simply a savvy consumer, who was impressed by the seeming integrity and concern of the owner whose ardent position is he would not provide for any consumer what he wouldn’t provide to his own grandchildren; especially true of BPA. See Eden Foods website FAQs. I might give this a try with a few changes to the recipe. I love Ketchup but I have a lot of food allergies, one of them is garlic! It is almost impossible to find any condiments that do not contain garlic and I’m pretty frustrated with such a limited selection. Some products will not list all of their ingredients, they simply state “spices” With food allergies I find it better to be safe than sorry and not purchase anything that does not have a complete list of ingredients. So in my case it is either homemade or not at all. I am glad that this was posted. It gives me a basic recipe to play around with. Fish sauce tastes nothingness like fish. I always tell newbies not to smell it until they’ve tasted it. I love it and keep it on hand. I used a couple different recipes for making homemade fermented ketchup. Once fermented it doesn’t taste anything like fish sauce. When I use the recipes that use fish sauce and salt it turns out too salty for me. So I am not sure if it is ok but I left out the salt and let the salt in the fish sauce be enough…used whey and lemon juice(lemon juice being what another recipe called for instead of whey). It tastes wonderful immediately so I hope after fermentation its the same. ALSO tomato paste does come in GLASS jars. BioNatura makes it. That is what I used. Then I put my ketchup in a Ball glass jar no BPA, no other petroleum based plastics involved. Bionatura offers organic tomato paste in a GLASS jar. So worth it. I’ve seen that in the store. I don’t know why, but I have a hard time buying tomato paste in such small quantities for so much money. I keep wanting to make this, but I keep thinking how much tomato paste it requires, and given the 1-3 bottles we go through every month or two, whether it’s worth the time and effort. Cheese Slave had a post about adding whey to store-bought fresh salsa for a no-prep version of lacto-fermented salsa (which I did and liked). Maybe adding whey to some organic ketchup can be a reasonable substitute. Now that I think of it, it’s probably best to hit the farmers’ market or grow your own tomatoes and make a bulk batch of paste for the year. I planted paste tomatoes to try that when they come in…hope it isn’t too time consuming making my own paste. I haven’t determined with 100% certainty that brown rice syrup contains no fructose, but I’ve heard that it doesn’t (via Paul Jaminet, Perfect Health Diet blog). From what I’ve been able to find, brown rice syrup is mostly glucose and maltose (two glucose molecules bound together), broken down enzymatically from amylose (a grain starch consisting of long chains of glucose bound together, which doesn’t taste sweet until it is broke into smaller molecules). We make amylose in our saliva (remember the Jr HS saltine experiment in biology class?). I have to watch my carbs/BG, too, so like all real sugar sweeteners, I use rice syrup very sparingly (because it is less sweet, it is really easy to use too much if you haven’t ratcheted down your sweet taste receptors with a long-term low sugar diet). I’m mindful of my concentrated/refined fructose intake just as much as glucose, perhaps even more. I can easily monitor what glucose does to my BG with a glucose meter, but I can’t as easily monitor what fructose does to my liver (increases triglycerides and liver enzymes, causes fatty liver, increases fat storage, etc.). Kelly, I do think I’d like to try this recipe since it’s lacto-fermented and I’m watching carbs right now. How would it taste with something other than maple syrup or less maple syrup? Another natural sweetener would be fine. Using less would also be OK, esp for adults, but for kids and for it to seem like the “real” kind at the store (ha! ), you may want to keep it at the same amount of sweetener. One more question… can you ferment anything with whey? My ketchup recipe calls for 1/2 cup of white vinegar (which I’ll probably switch to Braggs Apple Cider Vinegar since it’s better for you.) But would the vinegar be good or bad for fermenting? I know you can ferment mayo with lemon juice or vinegar in it, so I guess it would be okay. I’ve only fermented a handful of things before, but I’ve loved everything I’ve done! Amanda, sorry that I’m just now seeing this comment, I don’t know what happened. Yes, I’m pretty sure that you could use both whey & vinegar together, I’m don’t know why not, but I’m not great at fermenting yet, either so you may not want to take my word for it! I’ve made homemade ketchup a few times now. I started when I was on the beginning of finding REAL food, but before I’d even ever heard of Lacto-Fermented anything. This recipe that I use is SO good. It has a lot of ingredients but it is awesome. I’ve done it both with canned tomatoes and fresh tomatoes. Next time I make it I’m going to add whey and ferment it. Didn’t have time to read through all the comment but BioNaturae has tomato paste in glass jars. I buy it in case quantity from Azure Standards and it is reasonable price. The lacto-fermented recipe from GNOWFGLINS is really good. RE: Indian markets. Just read your labels carefully and watch out for vegetable oil ingredients. It seems there has been increasing substitution of “vegetable ghee” for real ghee (butter without the milk solids, which keeps better in warmer climates without refrigeration). India has a growing metabolic syndrome/CVD/diabesity problem, too, in part due to from shifts away from traditional diets. I’ve been to a number of the “ethnic” markets in the San Diego region, and while there are some great finds there in the fresh food sections in particular, in some ways it seems there are also perhaps more non-perishable products full of junk ingredients, especially on the “inner aisles” perhaps due to the greater need to increase shelf life and product stability during warehousing and long container ship voyages and so on. Fresh, real food just doesn’t travel as well as refined, processed, inert foods. Enjoy the markets, but as always, read the labels carefully and choose mainly from the perimeter of the store. Emily, this is great scoop!!! I’m going to find an Indian market by us – thank you! I wanted to let you know I get my tomato past from the local Indian market. The Indians stick to more pure food products overall. The paste is only tomatoes and salt and comes in large glass containers :). Also, it is much cheaper than anything found in American stores and most of the products grown in India are pesticide free or very low on them. According to my Indian friend they are just not socially acceptable over there. It is considered a desecration of the foods. There are several kinds of fish sauce that you can purchase. TRUE fish sauce is created by layering anchovies (or other similar fish) with salt and packing them together… basically like making sour kraut out of anchovies and selling the juice. — I’m sure the real deal is probably very good for you. That said, a lot of asian cultures use fish sauce, bonito flakes, broth made from fish and shellfish scraps (shrimp heads and tails), as well as seaweed to give dishes “Umami” (the fifth flavor). Basically it adds a more rounded out, full and complete flavor profile. Original ketchup was originated in asian cultures as a fishy sauce. ps. glad i found the site and I will be enrolling in the class shortly! I also make a quart of fermented fish sauce using some sardines (if I recall correctly). I used it in the ketchup batch. Turned out ok. What I would like to get a handle on is how to ferment my own tomato paste. Using a cooked product like commercial tomato paste seems to diminish the raw food aspect of fermenting. Jenn G, I use honey. Does anyone know how long homemade fish sauce lasts in the fridge? Mine smells yucky like sticky fish trash..is that normal? I made it a couple months ago. I made the NT version, complete with fish sauce. It doesn’t taste fishy at all, but too maple-syrup-y! Any suggestions on cutting down the maple syrup/sweet? Add more tomato paste, maybe? Interesting you bring up the BPA in cans… I was thinking of that as I was making the ketchup. You can’t win for trying these days, it seems. I think I will use up this batch, hiding it in stews/pasta sauces until gone, then buy the organic brand until my tomatoes come in for the summer. Thank you so much for this post, and the adapted recipe. Fish sauce is what has been keeping me from making my own ketchup! About BPA in cans, I’ve found that POMA brand (or something like that) makes a whole line of tomato products, which they sell in boxes, kind of like juice boxes, and they are BPA free. I haven’t really checked on tomato paste yet, though. Hopefully, there’s a BPA free product out there! Taylor, I’ve been getting the Bionature tomato products (paste too!) in glass jars and I love that at least SOMEONE sells them. I meant to make this last summer in the dehydrator. You can make tomato fruit leather and then whizz it up in a coffee grinder. I did that with pears to make fruit sugar for baking. I think so long as you know how it was made it could actually be more healthful than anything you can like tomato paste. Where do you get organic tomato powder? This is late but you can get an excellent tomato powder By Premier Research Labs. Just google it to find a source. I believe that http://www.nudefood.com carries it as well as http://www.oneradionetwork.com in their shopping section. Premier Research is the brand. If you’re worried about the BPA from the Tomato sauce cans, use organic tomato powder. I recently discovered this stuff shortly before we disposed of the last of our canned foods (for the same reason…BPA) and it is wonderful! Use with a little water to make tomato paste, a little more water for sauce, etc…. At about $20 a pound it goes a long way and the taste is amazing. I am going to try your fish sauce-less recipe this week and definitely use Alex’s tip with the old ketchup bottle to get by the kids. Thank you Kelly…and friends! I also use just anchovies in place of/addition to fish sauce. Then you don’t have to worry about any other additives. Pufina Patis brand fish sauce is the brand used by a Vietnamese immigrant I know. Pufina is made in the Philippine and is labeled “export quality” & “Commerce with the United States”, so perhaps that means that there are versions for domestic use that are somewhat different – hmmm. Ingredients listed are: Fish extract (assorted blends of scads, herrings, sardines, mackerel), water and salt less than 1/10 of 1% benzoate of soda added as preservative. Nutrient label lists a serving as 1 teaspoon (not tablespoon like the others I have), and 0 carbs/protein. Basically only sodium is counted, 570 mg in a serving. No sugars. Also says excellent for seasoning and general table use. Thai Kitchen brand (the most commonly available brand in conventional supermarkets and “natural” food stores) has anchovy extract, salt, pure cane sugar. The one I am currently using (from 99 Ranch, an Asian Supermarket chain in So Cal) is Tiparos brand, a product of Thailand, and it contains waer, anchovy extract, salt, sugar. Interestingly, the Thai Kitchen bottle says to “refrigerate after opening” and “salt crystals may naturally form in bottle”. The Tiparos bottle (and other Asian brands I have bought) say “Do not store product under refrigeration. Salt crystals may form in cold conditions.” I wonder if the difference is due to different target markets. Mainstream American consumers tend to refrigerate a lot of condiments (esp one with fish) and Asian/immigrant consumers may be more familiar with fermented and preserved products and know it doesn’t need refrigeration. Most of the fish sauce products will have ingredients much like these two, with only minor variations. I don’t quibble about the sugar content. After all, I rarely use more than a teaspoon or two, perhaps a tablespoon, in an entire dish for the family (3-6 servings). Both labels list 1 Tablespoon as a serving, so I suppose if you use it at the table as a condiment it matters, but we don’t. Thai kitchen lists 1 gm carb and no toehr nutrients except for sodium (1190 mg). Tiparos lists 3 gm. carb, 2 gm protein, iron 4%, and almost half as much sodium (690mg) as Thai Kitchen brand. While I was consulting the labels, I noticed that my bottle of Lea & Perrins Worcestershire sauce (also based on an old fermented recipe) now is made with HFCS. Sigh. Again, considering how infrequently I use it and in such small quantities, it’s not such a big deal to me. Perhaps when this huge bottle is used up I’ll see if I can find one without the HFCS. Until then, I’ll use it. That’s a shame, though, because L & P is the original Worcestershire sauce; whichever big conglomerate bought the family business couldn’t resist tinkering with the recipe to cheapen the ingredients. I’ve always been reluctant to buy generic WS. Two thoughts about fish sauce: (1) Ingredients shouldn’t go much beyond anchovies, salt, and water. Beware of MSG–lots of them have MSG in them! (2) Glass bottle is better than plastic, if you have a choice. I, too, would love to make this ketchup with some of my frozen tomatoes. I have a question about the fish sauce though: If I purchase it, is there anything I should avoid from the ingredients list? Beside the usual, I mean. I’ve seen lots of brands out there and don’t know anything about buying fish sauce. Maybe someone could recommend a good brand that is available everywhere (I’m in NC, not that close to a Trader Joes but we do have Whole Foods nearby). I’m paying close attention…bring it on! Bwahahaha, Kelly, you are awesome! Sustainable Eats, try cutting your brew with more tomatoes and fresh (non spicey) spices. As to BBQ sauce, I make my own using this ketchup as a base. Don’t have time to post a recipe right at the moment, but it would involve molasses, cider vinegar, garlic, and…? If I have the time, I could just post my ketchup recipe right here, cut and paste style. Later though; must run for my turkey at the farm! Yes Maureen, please post the link with directions from vine to jar. I made some this summer from my tomatoes run through a roma and it took 2 days to cook them down to thick. I made the mistake of putting the spices in from the get go and by the time it was thick enough it was bitter and way too spicey. I’d love to make it again but I didn’t like the taste and I have a few gallons of it now! Luckily the kids didn’t mind. But then when you are using it for hot lava to dip your tallow-fried potatoes in how can you go wrong? Would you mind letting us know when that link is up by commenting again here? Oh, Kelly, I beg to disagree with your conclusion on the ketchup! Did you have the ketchup at the Friday night dinner? That was mine, and so many people have commented on how much they loved it! I do use both fish sauce, and anchovy filets. It does not make the ketchup fishy, just rich and flavorful! I also use more spices, and start with crushed tomatos because we hate the consistency of ketchup made only with tomato paste. My recipe will be up on the WAPF conference recipe page as soon as Jill returns from her vacation. Give it a try; I make it by the gallon, it is so good! Fish sauce is great to add to soups even chicken soup to add a savory flavor and a little salty taste. Thanks, Cathy, I loved that ketchup! Maureen Diaz, The Nourishing Traditional Cook, made our Fermented Ketchup for the WAPF Conference from fresh tomatoes. I also always keep a bottle of fish sauce in my cupboard for its savory, salty, flavor-enhancing “umami” quality. Fish sauce doesn’t taste at all like it smells. I used to use Thai Kitchen brand because that’s about all I could find in the grocery stores in my community. But a Vietnamese acquaintance told me of his favorite fish sauce brand, which I found during a visit to an Asian supermarket in San Diego (99 Ranch Market). I used to keep fish sauce in the refrigerator, but I’ve noticed the brands sold in the Asian supermarket usually say on the label NOT to store in the refrigerator as cold conditions can cause salt crystal formation, which I noticed did happen, so I changed the location. With its supersaturated salt solution, fish sauce keeps fine in my kitchen cupboard next to vinegars and worcestershire sauce. I add fish sauce to any Thai-inspired coconut milk soup (easy variations on the coconut milk soups in Eat Fat Lose Fat). I make this quick soup to use up leftover meat, chicken, or fish. I use a touch of fish sauce in homemade Caesar salad dressing (when I don’t have any anchovies); when I need to substitute water because I don’t have much broth; in recipes that call for bouillon (which I no longer buy); and any other time a savory saltiness is called for. I add fish sauce in small doses and taste, because a little goes a long way. It takes me a year or two to use an entire 23 oz. bottle. So what else do you guys use fish sauce in?? I use store bought fish sauce (Thai Kitchen) and yes, I do keep it on hand. While I haven’t made ketchup yet, I have used the fish sauce in other things. It does not taste fishy – believe me, I would notice! It is sort of salty, but more than just salty. It adds a nice rich, salty flavor to foods. I wouldn’t hesitate to use it in ketchup if I ever tried to make it. I use the NT recipe. You can use just about any smaller fish. We just happen to use Hooligan, because they are a free resource. I would strongly advise straining off the liqid when its ready, outside. As to amounts, I made 2 quarts of it, and the liquid amount ended up being about 1 pint. More then enough to last a long time. You can get the Bionatura tomato paste from UNFI or from Whole Foods. Paula – do you have a post on how you make fish sauce? Or is it NT? Fish sauce does not taste like fish. Sure, it smells so bad it will clear the room when you open it, but it has a very mild flavor to say the least. I make my own, out of wild Hooligan we keep on hand. When I need it in a recipe, I open and add so fast!!! If I had company over though, I would actually step outside to add it, so they would not be scared off by the food, LOL! Hi Teena! To answer your BBQ sauce question. I had been buying “Bone Suckin’ Sauce” from a store up here in Rockford, and they also have it at Grist Mill (Cannonsburg Rd. ), but it’s around $5 or $6 a bottle and I recently came to my senses – how dumb to pay that when it’s SO easy to make…? I’m pretty slow sometimes! Think I’ll try that whiskey BBQ sauce. Thanks, everyone, for this great discussion!!!! I also use homemade ketchup to make a variation of KC style BBQ sauce from Dana Carpender’s Low Carb books, but I use maple syrup instead of Splenda. Like the ketchup, it’s really fast to make (even if you have to make a batch of ketchup first) and is made from all “real food” ingredients. I looked on the ketchup bottle and could not find the # of the plastic. I checked the Meijer Organic Peanut Butter and it is a #1. From the Meijer “Naturals” product line, the 32 oz. jar is $1.99 and has no HFCS or GMOs so that is what we buy. Does anyone have a good BBQ sauce recipe? All the ones in the store have HFCS. BioNaturae is at almost all the health food stores. I’ve never had trouble finding it and I stock up when it’s on sale. If you make a bunch of tomato paste/puree from the tomatoes at the Farmer’s Market, then you wouldn’t be starting with canned tomato paste. I have never made the NT recipe, but seeing your post gave me the idea to try it, as I have a bunch of frozen tomatoes from this summer. I have made this from the Nourishing Traditions recipe and as someone mentioned early on, after it sits for a while it is wonderful. I even use it in place of tomato paste at times because it is so rich and flavorful. Won’t ever want to buy ketchup again. Interesting post. Thanks for experimenting for us! 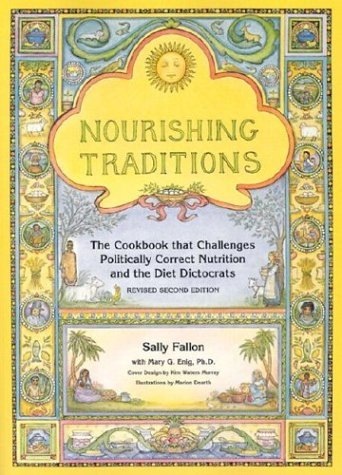 Yes, that fish sauce in the Nourishing Traditions recipe was a real “Ill never try this one” for me. Fish taste is too overpowering and my DH isn’t all that crazy about fish anyway. I did make homemade ketchup to can many years ago, but didn’t think it was all that great. We consume so little ketchup anyway that I’ll probably just stick to the organic brands. I made a few gallons of ketsup this summer from tomatoes and made the mistake of boiling the spices from the get go rather than waiting until it was thickened before adding them. It turned bitter and the spice is too strong. My kids still eat it but to me it ruins the taste of our homemade bbq sauce that I use it as a base for. It’s great in sloppy joes and meatloaf sauce though. Next summer I’ll use the NT recipe instead. I had kind of forgotten it during the height of canning season craziness. Kelly, thanks for phoning the manufacturer and letting them know – if more people did that there would no longer be BPA in anything. I haven’t made ketchup myself, but I have eaten lacto-fermented ketchup made according to WAPF principles and it was good. I don’t eat much of it, though, so haven’t bothered to make it myself. The point of fish sauce isn’t to make it fishy tasting, but to add the savoriness created by glutamic acid, if I remember correctly, the savory taste known as “umami” in Japanese; it’s what chemical food processors try to achieve with MSG, monosodium glutamate. The original ketchup was a fermented, fish-based condiment, if memory serves me right. i’d also go with ‘not worth it’. Trader joes hasorganic ketchup for 1.99, same size as muir glen, not sure on the type of plastic though. I can’t remember the last time I bought ketchup. I make it, but I use a different recipe than the one in NT, and it isn’t lacto-fermented, nor does it use fish sauce. But it is acceptable to my son’s friends, who are a tough-to-please crowd sometimes. I started with Dana Carpender’s no-sugar ketchup recipe from her many low carb books and tweaked it here and there. It’s very fast to make and it keeps a long time in the fridge. The main difference is that instead of Splenda, I use Grade B (dark & flavorful) maple syrup. I also don’t add the guar or zanthan gum, either; if liquid separates I simply stir it back in. I only make enough to fill a pint sized wide mouth glass jar, but with only one child, we don’t use as much ketchup as most families (plus he loves mustard and homemade mayo even more!). No one seems to mind not squeezing it out of a bottle, either. Canned tomato paste, diced tomatoes, and tomato sauce were some of the few remaining canned staple items in my pantry, but I’m trying to reduce my use of them for two reasons – first, the BPA can linings you mention, and second, I’m trying to cook more seasonally and simply not using tomatoes when they are out of season. But there are a few things I like to make that require some preserved tomato products. I found organic tomato paste packaged in glass jars at one of my locally owned chains of “natural foods” (the brand is Bionaturae and it’s imported from Italy). They are a bit pricey and definitely not local or seasonal, but I’ve cut my use of out-of-season tomatoes so much our winter-spring tomato consumption is low anyway and a few of these jars of paste a year won’t blow my budget. And they were on sale when I noticed them, so that’s a good time to stock the pantry. If I only need a tablespoon or two of paste, I can recap the jar and store it in the freezer; it is scoopable again with a short time to defrost on the counter. I re-use the small jars, too. I love you guys, have I mentioned that yet today?!!! OK, SO, for the BioNaturae tomato paste (I’m soooo excited about this), where do you all get it? LOVE knowing that the WF brand of ketchup is in a #1 bottle, that’s the other kind I get now and then, thanks to my sweet sister who lives near a WFM. Guess I’ll get lots at a time from now on and keep stocked up, unless I DO try to make the ketchup again…now that I know there is paste out there in glass jars. Have a great weekend everyone, and keep commenting – I love reading them all! For the tiny amount of effort it takes, and for the amount of ketchup I personally like to use right now (pregnancy cravings! ), I find this very worthwhile. I also have been using the BioNaturae in glass jars for years. FYI for Celiacs, I also contacted the company to ask if their tomato paste was gluten free, and it is. BioNaturae also makes a lot of pasta, so I had to be sure. We use lots of ketchup so I do make mine. I use it in BBQ sauces, Sloppy Joes, cocktail sauce and of course on hotdogs & hamburgers. I do have 5 kids….so ketchup comes into play a lot around here. I make it without the fish sauce but with Tamari in place. It is really good. I know what you mean about the BPA. I have always used Muir Glen but I am pretty sure their cans contain BPA in the lining. I guess I could start making my own tomato paste but that is just one more thing. The fermented ketchup is good as a novelty for us, but no one notices much if there’s no ketchup in the house. We prefer our burgers with just cheese and bacon! I just made this not to long ago for the first time and we love it! I should add more water as mine is a bit thicker than my husband likes, but I also added twice the garlic! Yummo! I didn’t have fish sauce either, but it was good to read the comments that others added it and it didn’t effect the taste. with the Bionaturae paste in jars, but I’m glad to see that someone else already informed you about it! Thank you for all your wonderful posts-I love them! I pretty much use the exact recipe as you, Kelly! My family hasn’t objected to it much. I personally really like it, it tastes so much more real than the bottled stuff – I can’t even enjoy restaurant ketchup any more at all! I guess it’s not perfect with the canned tomato sauce, but since we don’t eat a lot of ketchup, either, I figure it’s not the worst we could do. Can’t do it all perfectly, right? But I like Mindy’s idea of making ketchup from homegrown tomatoes. That has to be the best option if it’s available. Thanks for the idea, Mindy! I have to agree, Kelly. I used Ren’s recipe over the summer and although I thought it was great, we just don’t eat enough ketchup to justify it for me. We use the Trader Joe’s brand. It’s organic and the ingredient list does not gross me out. And it also comes in a #1 plastic bottle. I can live with that. I’ve made the ketchup from Nourishing Traditions and it was gross. No one ate it. It lasted forever in the fridge before I threw it out. We simply stopped using ketchup unless we go out for dinner. I may consider making it w/o fish next time and see if we like it. I will definitely try this but half the recipe. I don’t want the corn syrup either. I have been making my own with a recipe using vinegar but will definitely give this a try. I made ketchup this week. I used Ren’s recipe https://ediblearia.com/2009/05/28/updated-compound-tomato-sauce-lacto-fermented-ketchup/ and put anchovies in it since I didn’t have fish sauce. It will be ready to put in the fridge today. I tasted it when it was mixed up before it fermented and I thought it was wonderful. Of course, the big test will be when I serve it to the family. They are pretty good sports about my kitchen experiments but messing with their ketchup might be taking it a little too far. 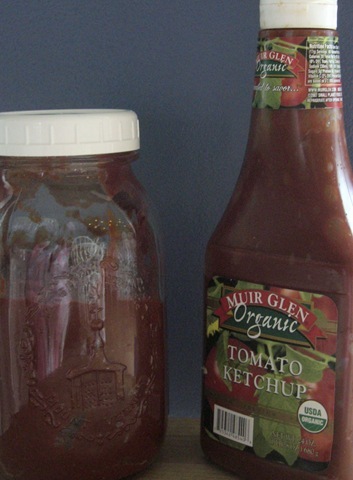 I used my garden tomatoes to make lacto-fermented ketchup. I was very happy with the results. It has been storing well for several months. I started using jars with a rubber seal on all my lacto-fermented foods. I just use a canning jar lid not heated. When I used a plastic lid I would get white stuff on the top of the food. I would definitely make it again. I also use the homemade ketchup in other recipies – salad dressing, sloppy joes, etc. Thanks for doing this one, Kelly. I have wondered about making my own, but just haven’t wanted something else to have to bring the family around to. Like you, I’ve sneaked foods by in reused containers and such, but I have to say, they are getting suspicious of me! 😉 To think…my own mother did this with dry milk in the milk carton when I was a kid! Blech! Thanks for sharing this, Kelly. I used to put ketchup on everything! In fact, I think french fries are nothing more than dipping sticks for ketchup. 🙂 I obviously don’t use it much anymore, but still enjoy it when I have french fries on occasion. I may try making fermented ketchup at some point, but I expect that I’ll come to the same conclusion as you. I probably won’t use it enough to justify it. I’m with you. We rarely eat ketchup and I too have switched over to the organic variety to avoid HFCS. (BTW, Whole Foods organic line has a great one that is generally a dollar or two cheaper than Muir Glen.) The only time I use it is on hamburgers or in meatloaf as we don’t really even buy hotdogs (if we buy anything resembling a hotdog, it tends to be a bratwurst or other smoked sausage which we tend to dip in dijon instead.) And, to buy organic tomato paste to make it? The cost difference doesn’t even out. I applaud your efforts and it looks great, but I agree, it’s one of those things that I’ll probably just continue to buy storebought and spend my time making by scratch something else that 1)we eat more of, and 2)I can make cheaper and better than store bought. Bionatura makes an organic tomato paste in a glass jar. That is what I use to make the ketchup along with Thai Kitchen’s fish sauce. It doesn’t taste fishy at all. I include the whey and it lasts for a very long time. I have not had a problem mold and I have stored mine for many months. I made the lacto-fermented Katsup and it was good, but the density of it made it a very happy medium for mold to grow. I think once you make it, it has to be consumed within a short period of time–it doesn’t have the shelf life that commercial brands have, even though it has been fermented. I’ve yet to try making it but I don’t anticipate doing so unless someday I have kids who want it. Not a ketchup fan, period. Probably for the reason you mentioned, the HFCS. If I want a condiment I turn to mustard. LOVE mustard. I make and use this ketchup recipe (just as it is listed in Nourishing Traditions) because it tastes great! No fishy after taste at all. In fact, the finished product tastes very gourmet in comparison to regular store-purchased ketchup. I always use Sally’s homemade ketchup recipe and instead of fish sauce, I use half the amount asked of fish stock. It gives me some of the nutrients, but the ketchup doesn’t taste like fish! I can state from personal experience that when you let it ferment long enough (3 days at room temperature, followed by 1-2 months in the fridge), there is no “fishy” taste at all. Good stuff! I only have two people in the house who eat it, so I don’t make it that often, but a quart lasts forever. Maybe you could find tomato paste in glass jars? I have thought and thought about this recipe, and whether or not I’d ever try it. And then I came to the same conclusion you did, and I haven’t attempted the recipe yet. We do use more ketchup than your family might, because one of my son’s favorite things to eat is Organic Prairie hot dogs made of beef (their meats are pasture-raised, I called and asked them about two years ago). He loves ketchup and mustard, both of which we buy organic, but we use in small quantities, so it’s not a heck of a lot of money we’re spending. But I was glad to read this post because I’ve wondered also about the plastic lining in cans. 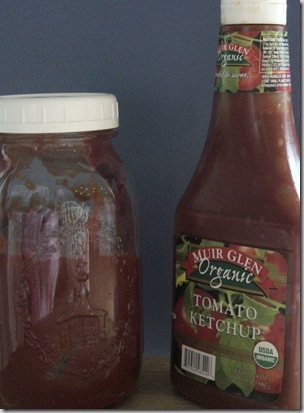 We do buy the Muir Glen brand for canned tomatoes – it’s really one of the only things I buy in cans besides the Natural Value organic brand’s tuna and kidney or black beans on occasion. But I’ve been very wary of this, like you. So we keep cans to a minimum too.